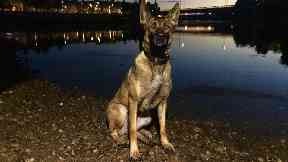 A police dog has sniffed out an alleged drink-driver who fled half-a-mile from a crash in Angus. Amber was called to Union Street in Brechin at around 2am last Saturday after a car careered off the road and landed on its roof. After realising the driver wasn't within the vehicle, Amber was let off her leash to help in the search. A 23-year-old man was quickly tracked down and subsequently arrested and charged with drink-driving. Tayside Police Division later praised the canine, posting on Facebook: "Nice job PD Amber and PC McMaster. Good doggy." A Police Scotland spokesman told STV News that a report will be sent to the Procurator Fiscal.